It is a dim and dreary day here in Toronto, really too dark to take excellent pictures, which is a shame, because I finished the Peacock Feathers shawl, and my relief is just about overwhelming, since the crawl to the finish line on this one was pretty brutal. 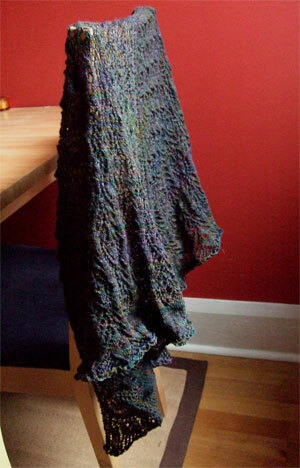 At the end of the shawl there were 495 stitches on the needle. Purling back across the wrong side rows when you’re not doing any patterning holds my attention about as well as watching tea steep, and then just when you’re ready to congratulate yourself for sticking to the knitting and finishing the thing up… you’ve got the cast off. 495 stitches, all of which have to be gathered into groups of three, joined by crochet chains. Now, many of you know of my deep personal struggle with crochet. I do it when I have to, but the loop and hook path is not one that fits for me, and it shows in my work, and in my mood while I do it. This cast off sure is pretty, but while I was making all 165 of those little loops, the work moved with all the speed of a teenager’s thoughts on separating your dedicates from towels in the laundry. I could have washed my entire kitchen floor with a toothbrush. I could have served a fried rice buffet with only tweezers as utensils. It. Was. Slow. Hours, that took (and I made it worse by watching the news while I did it, and listening to politicians talk about the bailout may have actually made time move backwards. Has anybody else noticed that they aren’t really saying anything?) but when I finally finished it was like being given a great present. It was one of those things that went on for so long that when you’re finally finished you’re almost surprised when it’s finally over? Just when you’ve accepted that you’re going to be doing a crochet cast off for the rest of your life and have resigned yourself to that being the total scope of your existence and not fighting it at all anymore… suddenly there are no more stitches on the needle and the work just sits there being all done. I’m so happy I could eat it. It’s finished, and this shawl is two things. Beautiful, and HUGE. I have no idea where I’m going to block it…or where I’m going to find 165 pins for all those loops. 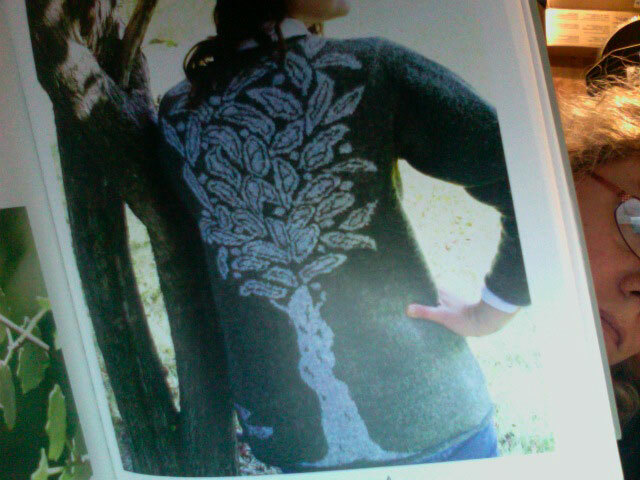 I wonder what I should knit now? I need something to take on tour. I’m thinking more lace, although I’m also pretty interested in scarves right now, having noticed while I was in Europe that this whole accessory thing might be part of the reason that they all are wearing outfits and I am only wearing clothes. Maybe lace scarf? Suggestions? I’ll be upstairs with all my pins. I am pretty sure that I am an ordinary Canadian. I’ve checked the Stats Can website, and other than the fact that Joe and I earn a little less than the national average and seem to have picked up an extra kid along the way, we’re really, really ordinary. This is why Sir, I was absolutely flabbergasted to learn that you had made a statement that the arts “don’t resonate” with “ordinary Canadians”. I had suspected, after your 45 million dollars in cuts to the arts, that they didn’t resonate with you… but all ordinary Canadians? I listened as you lashed out at artists, claiming that we stand around at “rich galas” complaining that our subsidies aren’t big enough, and I could hardly speak. Although Joe and I both work in the arts, we’ve never been to a gala (though I hear that your wife is honorary chair of the National Arts Centre Gala) and although we both pay taxes, we’ve never received a subsidy or a grant… so I’m really not quite sure what you’re talking about. Joe and I added up the number of people we know working in the arts. It was virtually everyone we know (with the exception of our friends who work in Health Care, but that’s a debate for another day) and not a single one of them are as wealthy as you, although most of them pay more taxes. Sorry. That was cheap. I’m still mad about your tax breaks for the richest Canadians. I’ll try to get a hold of myself and stick to the facts. The fact is that last year your government invested 3.3 billion dollars in the arts, which would be shocking except for the fact that (as reported by ACTRA’s national president Richard Hardacre) the arts returned the favour by providing 1.1 million jobs within cultural industries and contributed $86 billion to the GDP. To put that in context, Margaret Atwood noted that the arts industry employs roughly the same number of Canadians as agriculture, forestry, fishing, mining, oil & gas and utilities – combined. I see you Sir, day after day after day, talking quite rightly about jobs lost in manufacturing and the industries named above and how our country needs to make financial investments in their businesses to create as many jobs as we can, and dude… you’re absolutely right. Job loss in Canada is a huge thing and boy, should the leader of this country ever be trying to prevent any further loss any way he can… and Mr. Harper… that’s what makes your cuts and your statements so darned confusing to me. I’ve thought and thought about it, and I’ve come up with some possibilities for why you’re doing what you’re doing. 2. You had no idea that the Arts industry was an actual industry (I mean, not like cars or oil) or that it employed that many Canadians, and when you walked off stage after making your statement, you had to ask someone why your entire campaign staff was lying on the floor seizing in a pool of their own cold sweat. 3. You’re still sort of scarred about that day in kindergarten when the teacher said that Bobby’s fingerpainting was nice and didn’t say anything about yours, and then on top of it he got the be the carrot in the school play when the teacher knew you wanted to be the carrot and would make a way better carrot than him and ever since then you just haven’t been able to see what the big deal is with the whole art thing. 4. Maybe Gordon Pinsent has always sort of annoyed you and this is a revenge thing. 5. You made a strategic decision to say that. You sat down and decided that there were an awful lot of Canadians (a lot more than 1.1 million) who would really, really want to stick it to artists. You figured that there must be an awful lot of voters who don’t read books, don’t go to the movies, don’t listen to CD’s, don’t dance or watch dance, don’t read magazines or newspapers, don’t listen to the radio and wouldn’t touch the TV with a ten foot pole and therefore don’t have the arts “resonate” in their lives. Some time ago, when I made a political comment in this space, someone said to me that if I were going to state my political position publicly – even if I did so without condemning the views of others, that I should expect to lose the support of people who didn’t agree with me. They felt that if I said I wasn’t a conservative (or a whatever), that I should expect to lose the readership of conservatives (or whatevers). This person maintained that simply not being on the same page politically was enough to justify not continuing to support me professionally. This is a position I was absolutely stunned to read and still don’t understand. I feel that politics belong in public. That ones political positions are a reflection of ones moral and ethical concerns, and that as long as no-one is condemned for their views or insulted for their beliefs, that everyone wins when politics are discussed in the pubs, kitchens and blogs of the nation. That’s something I’ve kept in mind as I listened to your speeches throughout this campaign. I reflected on how your political positions were reflecting your ethics, and kept a clear head – listening to your positions and promises. I stuck to my position, which is that it is possible to disagree on matters of personal choice while still liking, respecting and enjoying the people with whom you debate or disagree, and I believe that it is unchecked politics, unexamined policy and an unconcerned nation that let politicians run amok and invites corruption of all forms. In short, Mr. Harper… I think that the cornerstone of all good politics is respect. Respect for positions that run counter to yours, respect for jobs that are not like yours, and in this case, respect for all Canadians…. especially as you ask for our votes. I would submit, Mr. Harper, that suggesting to all of Canada that a particular 1.1 million Canadians who have helped to pay your salary for the last several years and whose money you would like the privilege of continuing to spend, are not “ordinary Canadians” is the absolute definition of disrespect. Further to that, claiming that you represent “ordinary Canadians” (we’ll overlook the number of galas you’re at in a year) while the 1.1 million of us who are working in film, music, writing, dance… are not only excluded from your definition of “ordinary Canadians”, but according to you “don’t resonate” with the people who are…. Well. I think it was rude. Darned rude. The Canada that I thought I lived in doesn’t have some Canadians who are worth the efforts of the Prime Minister, and some Canadians who are not. The sort of Canada I want to live in has always had a society based on respect, the respect we are supposed to show each other and the respect that leaders are especially expected – or maybe owed to give their constituents was entirely absent in your statement, and a leader who is that rude to his fellow Canadians, boldly and in public – isn’t observing the cornerstone of civil and progressive politics… respect. In light of that, and remembering that ones politics are a reflection of ones morals and ethics – I’m afraid that not only have you lost my vote (Oh, fine. You didn’t have it anyway) but greater than that and with every cell that I posess… I humbly withdraw my respect for you as a leader, and submit that there’s just got to be a lot of “ordinary Canadians” who feel the same way. (PPS – For the Non-Canadians who are thinking “huh?”, Mr. Stephen Harper is our Prime Minister, and the leader of the Conservative Party in Canada. During our last election he formed a minority government, winning 124 of 308 seats, and 36% of the popular vote, which means that roughly 2/3 of voting Canadians didn’t vote for him or his party, and chose an option to the left. (There are no options to the right of Mr. Harper.) This is possible because we have a multi-party system. Mr. Harper and the other party Leaders, Gilles Duceppe of the Bloc Quebecois (a federal party that only runs in the enormous province of Quebec), Stéphane Dion of the Liberal Party, Jack Layton of the NDP and Elizabeth May of the Green Party (I’m leaving out others, but they don’t hold seats in parliament) have been campaigning since The Prime Minister asked the Governor General to prorogued Parliament earlier this month (that’s sort of like dissolving the current session so they can start fresh with a new government after the election) and calling an election for the 14th of October. (We do it fast.) In Canada, we don’t have set dates for an election. We hold them whenever the party in power thinks it would be a good time or they run out of time (at least every five years) or whenever a government loses a confidence vote (which is essentially like getting fired.) We have no term limits – you can be Prime Minister for as long (William Lyon MacKenzie King served a total of 21 years as Prime Minister) or as little (Sir Charles Tupper was Prime Minister for 68 days) as the Canadian people allow you to serve. It’s That Laurie’s birthday. If you don’t know who That Laurie is, then you haven’t been reading very long. 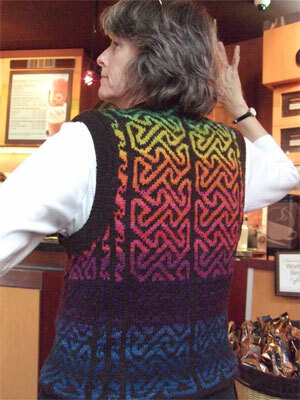 That Laurie is a blogless wonder of a knitter, esteemed and clever to her very core, and the source of some of the very, very coolest guest posts ever written on this blog. 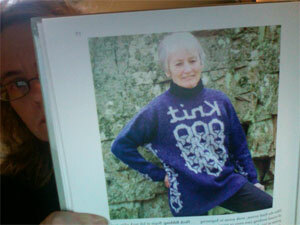 That Laurie is a real source of knitterly genius in the world… and her name came about as a result of it. Laurie who? Laurie with the incredible shawl/sweater/roving/ yarn/socks…..
Oh right. THAT Laurie. Every time I see her she’s wearing something incredible, or has something incredible to teach me or something incredible to show me. I invite you to take a minute today to peruse some of her genius (I have helpfully listed them for you so that you may revel freely in all that is That Laurie) and then dudes…..
Honk if you love That Laurie! Feet Treat - in which we meet the wonder that is That Laurie’s hand dyed, colour progression yarn. The Wool House Presents: In which That Laurie begins to talk about how to dye colour progression roving. Indigo Adventure: Part one – where That Laurie learns about indigo dying and so do we. Mood Indigo: the third part. 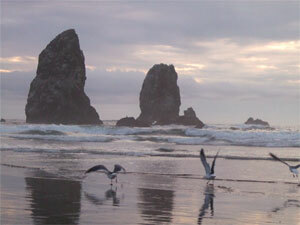 Indigo Addendum: In which That Laurie answers questions and ties up loose ends. She’s Gone to Pieces: In which That Laurie starts thinking about stuff in bits. The Yokes on Me: In which That Laurie proves that it’s good for us when she’s obsessed. The Rainbow Spiral: In which you wish you thought of that. That Laurie, I miss you! Therefore, I got nothing. Can’t take lace blob pictures, can’t take Hey Teach pictures…. so I decided that today was a great day to start something I’ve been thinking about for a while. I’ve got all of these fantastic knitting books, I’m sure you do too… and I thought that I might start reviewing them. Actually, that’s not accurate. Not really “reviewing” because I think that implies that I might trash one (and as an author, I feel like I can’t do that to another author, no more than I could walk up to them at a party and slap them in the face. I know other people will do critical reviews, and that’s cool, but I won’t be one of them. 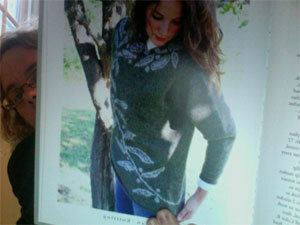 Code of the knitting book author.) but talking about what’s inside of the book so that maybe you would know more about if you’re interested in it. I’m going to do this once in a while, and I’m going to call it “Other peoples books”. First up? A really interesting book that has been kicking around my office for a while. (Those are the books I’m starting with. Books that arrived in the house and haven’t made it to a bookshelf. I think it’s a good sign when six months after I got it it’s still near my desk or on the bathroom shelf.) It’s Meg Swansen and Joyce Williams Armenian Knitting. Hold on. I can take a crappy photo with the camera on my Macbook. Obviously the writing on the actual book isn’t reversed, it just looks that way because I used the macbook and I can’t figure out how to flip it in Imageready. Now, to be really honest, there are some of you who aren’t going to be very interested in this book. This is a niche book. 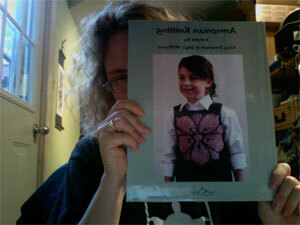 This is a book for a specific sort of knitter. This book details the technique that was used in the knitted sweaters of the designer Elsa Schiaparelli – most famously the Bowknot sweater, (which is famous enough that I bet you’ve seen it somewhere) and gives patterns for about a dozen projects to knit using this technique to it’s best advantage. and the branches dripping ’round the front…. Some of the most interesting patterns in this book to me are the ones where the colour held behind and trapped (to create the visible “peeks”) changes throughout. There’s the Lily Jacket, where there are three shifts of the colour, and it creates not just the lily design, but a wonderful shading of colour on the whole garment. Interesting idea, this trapping of colour – where it is used throughout, especially with the shifts of colour it reminds me of some of the principles of pointillism, or the thilll of the flecks in tweed yarns. This is a simple book. There are about a dozen patterns, clear photos and illustrations demonstrating what Meg and Joyce have found to be the most efficient ways to trap, and as always from this pair, charming prose. There are other calling cards of Schoolhouse Press throughout -for example, in the fine tradition of Elizabeth Zimmermann, the garments appear in one size each. 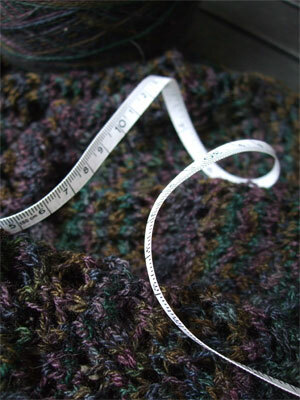 Where it is possible to up or downsize the pattern, a note may be made about the best place or manner to do so… and after much careful perusal, I believe that a knitter who was willing to think a little could easily make the modifications to most of the patterns to generate other sizes. (With some exceptions. A few of the patterns have designs that preclude simple up or downsizing – but may be possible to translate into other sizes using gauge alchemy.) If you are a knitter who usually needs a pattern that is much smaller or larger than a medium (and you don’t know anybody who is a medium who you would love to knit a sweater for) and you are not a knitter who likes to think while you are knitting (fair enough. Some of us do it to turn our brains off for a bit) then you might have a hard time, not with the technique, which I truly believe could be mastered by anybody… but the patterns. If, on the other hand, you are a knitter who is interested in the history of knitting, interested in adding as many tools and to your knitterly toolbox as you can, interested in techniques the way that I am interested in my morning cup(s) of coffee …or interested in supporting endeavours to record knitting history, technique and tools before the people who know this stuff are lost to us… then this book is going to be a charming addition to your bookshelf. 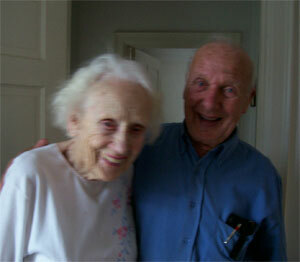 Early this morning, at the grand age of 94, my Great Aunt Helen passed away. She had been declining for a few weeks, and finally went to sleep a few days ago, dying last night in the arms of my Uncle Don, her husband of 57 years. I went to Helen and Don’s every boxing day of my life, and when my kids were little, I spoke with Helen almost every day. She had a lot of sanity. Earlier this year, it became clear that Helen and Don could absolutely no longer live on their own, and they moved together to a nursing home that Helen never really got the hang of, and a few weeks ago she stopped eating and weakened very quickly. We all wondered if she’d found a way to leave the place…one way or another, although Helen claimed that wasn’t her plan. A lot of uncomfortable testing seemed like it would injure her for more than it was worth, and she wasn’t in any pain, so I guess we’ll never really know. I think it was three things. 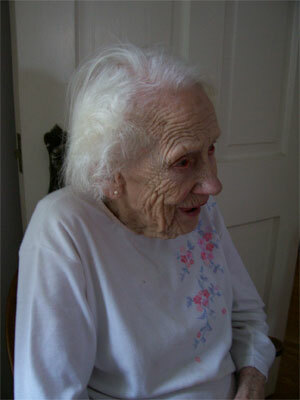 Old age, a broken heart at leaving her home, and a reluctance to stay and watch Don decline further than he had already. The last time I saw her was a visit a few months ago, before she was transitioned from the temporary nursing home here in Toronto to the one she and Don have been at in Sudbury. It was obvious to me then that she was fragile, but Helen has been old my whole life, and I somehow thought that she and Don weren’t playing by the same rules as the rest of humanity, and I realize now that some small part of me really did think that she might live forever. I had hoped she would live long enough to see the essay about her in this last book… but maybe it’s better this way. I’m trying not to feel very sad about it. It was a good life, a happy life and a very long life with a peaceful ending. What’s breaking my heart is sadness for my Uncle Don, because I just don’t know how you go on alone after almost 60 years in each others fine company. I have no idea how you would do it. Some of the greatest (and most interesting) things that have ever happened to me have been preceded by the thought “You know what would be fun?” It’s how I ended up with Joe, how I got the kids, how I became a writer, why there’s so much wool in the house, the Knitting Olympics, Socks in Central Park… you get the idea. In short. We’re really excited. We think it’s going to be really, really, really cool. (We’ve said that a lot these last couple of days.) We’ve also said that we think that with the pool of knowledge and planning we have going into this, that we have a chance to really make this an extraordinary event for Students, Teachers, Vendors, Guilds and other Sock people. That’s us. Sock people. Keepin’ it going on. Thoughts? Very busy weekend (I got on a plane again, more about that later) but wanted to take a moment to post the schedule for the upcoming book tour. 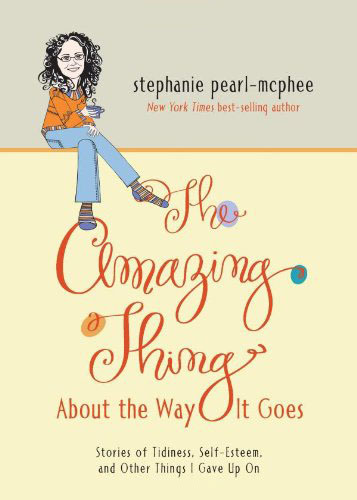 It’s short, it’s sweet (it’s with a different publisher – my previous book of essays was with Andrews McMeel, and so this one is too) and it’s being set up by Kathy-the-publicist-that-I-haven’t-mocked-with-a-title-yet, instead of your good friend and mine, Jayme-the-wonder-publicist, who is with Storey Publishing, so don’t call her and ask her all sorts of stuff about the tour or the book because this time it’s not her problem. (I imagine that right now Jayme is remembering all of the times that things got ugly on the road and all I had with me was a big problem, a poor attitude and her phone number, and thinking “Have a good time Kathy.” ) I’ll post this on the tour page as soon as I can. San Francisco – Saturday, October 4th, 3:00pm, Copperfield’s Books, Montgomery Village, 2314 Montgomery Drive, Santa Rosa, CA. 95404. Kansas City– Monday October 13th, 7:00 Rainy Day Books, Event held at Unity Temple. 707 W 47th Street Kansas City, MO. Tickets are needed- call Rainy Day Books at (913) 384-3126 to get the details. New York – Tuesday, October 14th, 7:00 Barnes & Noble, Park Slope, 267 7th Avenue, Brooklyn, NY. Doors will open at 6:30 p.m. Seating will be first come first serve. There will also be a signing at Rhinebeck, though not a talk – details to follow. 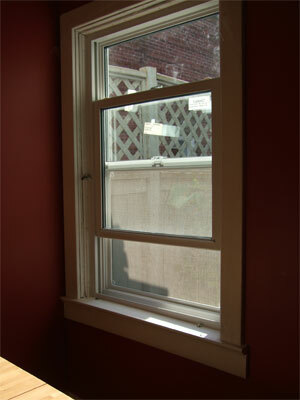 I spent the afternoon watching some guys install a new window in my dining room. My old window was really old… the last original window in the house (and the house is about 120 years old) and it was really a piece of junk. In the wintertime a wind blew through it even when it was closed, and people competed not to sit with their back to it. The ropes inside the frame had long ago turned to dust, and the lead counterweights had fallen down into the walls sometime before I got the house, leaving only the skeletal pulleys sitting aimlessly in the sides. This meant that until it’s last paint job, if you wanted to to stay open you had to prop it with something, or it would slide shut with a terrifying bang at 3:00am when the humidity went down a little. Conversely, if you did manage to get it open and prop it open (and this was no small feat) then if the humidity happened to go up while it was open… then open it stayed. I remember engaging with it during a rainstorm and trying to close it with a hammer… to absolutely no avail. After its last paint job it retired from the opening business entirely – leaving an ever growing collection of flies petrifying inside it. It was junk – total junk, but it was our junk, and since Joe and I both earn an “artistic” (read – unreliable) income that doesn’t allow for a whole lot of new windows, so we sealed it off with that weird plastic you shrink with a hair dryer and tried to make do it until we could afford it. This years tax refund had a little more give in it than we were hoping for, and we ordered the new window, and me, who is usually reluctant to buy anything (I don’t like to spend money. You just never know when more is coming) I gleefully paid for it – only thinking once about how many sweaters worth of cash it was costing. I was thinking about how usually, I really hate buying anything (except yarn – and even then I am a woman of some restraint) and how the last time I was happy to buy something that wasn’t yarn it was a stove, and that’s when it hit me. Dudes. I’m a grown up. Did I mention it came with argon? A little Q&A from the comments yesterday, on the bigness of my shawl and the problems and joys of same. Why not just figure out how long you do want it and stop there? Yeah, that was my initial response too, and then I remembered that the measurements are clearly printed on the front of the pattern in perfectly legible print in a language I read. (Allegedly.) My kneejerk reaction of HOW AM I SUPPOSED TO TELL was immediately answered by the voice of reason in the back of my head (and boy do I ever resent the voice of reason when I’m trying to work up a proper froth of indignation) that said “Well, call me crazy but did you consider reading the measurements?” (Hate that voice.) I don’t think I can pin that one on the designer – and I’m not sure it would solve the problem totally either, unless we could get them to tell us how big the real live person they had it modelled on was. Here’s a line I would love to read on all knitting patterns (were I in charge of the world.) “This sweater is knit in the 38″ size, and is here being modelled by a human who is 5’4″ and has a 36″ chest.” Now that would be helpful. And where are you going to block this behemoth? Considering that there isn’t a room big enough in my house without moving furniture to other rooms… I was thinking about the park. Maybe a picnic would be nice. I guess you’re at that age where growing into it is probably out of the question, huh? Lizbon has more of a statement than a question. Huh. You wouldn’t believe who else suggested that. Last night I was showing off the Peacock Feathers shawl to Ken, and I was holding it up and spreading it out and doing all of those things that you do when you’re knitting lace to try and convince other people that it is actually going to be really cool once you’re finished and it’s blocked, and I held it up along the line down the centre of it… stretching it out along that line, and Ken asked how much more I had to go. 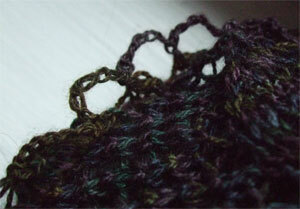 “Well” I said, “there are 250 rows total, plus a crochet chain cast off, and I’m on row…. (here I checked the chart and heaved a sigh that I hope conveyed how much more there is to go) row 171″ and as I said that, I realized something. I was holding out that centre line a really good distance. Like… maybe 70cm, which is a pretty good distance for a shawl, except that I had half as much length again to knit – which would have this shawl coming in at a whopping 100cm, (that’s a metre) or maybe even more, since a gentle stretch between my hands isn’t the same as a proper blocking. A shawl more than a metre long? For reference, I’m only about 150cm tall, and a good 25cm (at least) of that is my head and neck (over which I do not traditionally place a shawl) … so this shawl is going to be really big on me. Super big. When something is turning out bigger than I thought it would, my first thought always turns to my old enemy… Gauge. (I capitalize it here to show it the respect it deserves.) I have a tendency to knit a little loosely, so I checked my Gauge. (I do not want to hear a word from anyone suggesting that I might have considered checking it before I started knitting. Knitters in glass houses shouldn’t throw stones.) Gauge was fine. Gauge was perfect actually. Spot on. I was totally stumped. Why on earth was it coming out so big? I don’t want to talk about how long was before it occurred to me that maybe this was the intended size, and I should check the measurements on the pattern (which I was sure I had done – but I didn’t remember reading that this was a big shawl…so maybe I didn’t.) I fetched the pattern from the living room, brought it into the kitchen and was about to read out to Ken that the shawl wasn’t really that big- that it was 88″ from tip to tip along the top, and 43″ down that centre line… when I realized what had gone wrong. I have no idea how big that is. I had read 88″ and thought… well. I don’t know what I thought. I guess I didn’t think. I read the measurements aloud to Ken and he gave me the same glazed look. We opened conversion software on my laptop, and entered 43 inches, and pushed the button to convert it to centimetres. 110cm. This shawl was only 40cm (15″) shorter than my height. We punched in 88 inches to find out the wingspan, and I exhaled in whoosh. 223 cm. (Almost 7 and a half feet.) 223 cm. How about that. The imperial measurements (which turn out to be really accurate) didn’t even register on my brain as information. Turns out I’m knitting a big shawl. 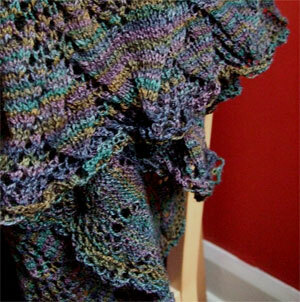 A shawl that after blocking, may drag on the ground like a train behind me. Now I know why it’s taking so long. Maybe it’s not a shawl. Maybe it’s…. A car cover, or a para-sail. Yeah. Maybe I’m knitting a shawl for the pick-up truck. Arrgh. Maybe I could felt it.